When we contribute actively and consciously to world peace, we also offer ourselves a most beautiful gift: greater inner peace and spiritual nourishment. Would be so wonderful if you could start the year as part of the world wide effort to make ours a more peaceful, accepting world. These beautiful, explicitly inclusive gatherings from “Interfaith in Sydney” start again for this year this coming Sunday – and will follow every THIRD SUNDAY of each month, starting at 11am. Leadership from Rev Dr Stephanie Dowrick, Dr Kim Cunio, Charlie Hogg and Caroline Ward. Most months the talk is given by Stephanie – as it will be in January. 181 First Avenue, Five Dock, Sydney. Easy street parking. Buses to Great North Road. Please arrive shortly before 11am if possible. 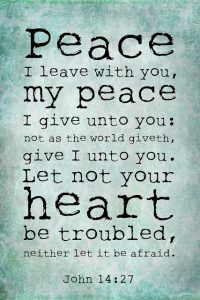 Our services are part of a worldwide, global effort for world peace each 3rd Sunday – bringing the personal peace that must accompany it. 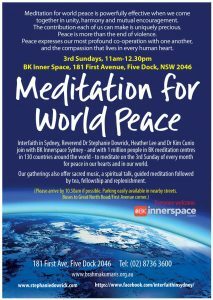 In Sydney, we also provide music, an uplifting talk, meditation guidance – plus tea, coffee, fellowship to follow. May we ask you please to participate from wherever you are, and to share this invitation – either by email personally, or via social media. We never know when a gathering – and invitation – such as ours is deeply needed by someone. Interfaith in Sydney, led by Reverend Dr Stephanie Dowrick and with music and community ministry led by Dr Kim Cunio, have been offering services in Sydney since June 2006. Since early 2018, we have joined (spiritual) forces with the peace-giving, spacious and very welcoming InnerSpace Centre, hosted by the Brahma Kumaris, leading teachers of Raja Yoga, offering unconditionally inclusive soul-conscious, peaceful meditation and positive living. Reverend Dr Stephanie Dowrick is the author of many books, including Intimacy and Solitude, Forgiveness and Other Acts of Love, In the Company of Rilke, The Universal Heart, Seeking the Sacred, Everyday Kindness, Heaven on Earth. 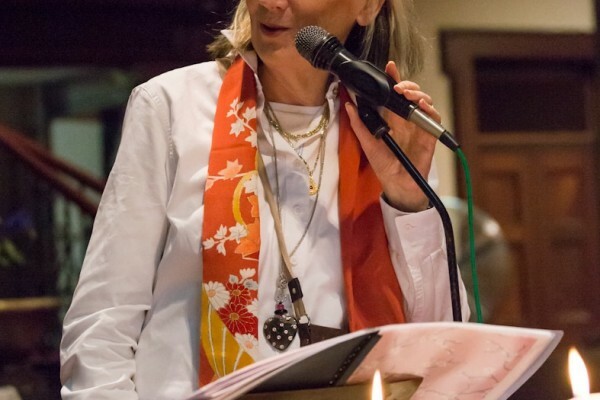 She has been leading “Interfaith in Sydney”, along with Dr Kim Cunio, since 2006. Stephanie also leads longer, residential spiritual retreats at Mana Retreat Centre, Coromandel, New Zealand. There are many inspirational talks available via the Interfaith in Sydney YouTube link. Whatever your faith journey, we belong to a single human/divine family. With all that we do and offer, we hope to reflect that.